Earlier this summer we were at home for a dear friend’s wedding and got to spend some time with friends and family. 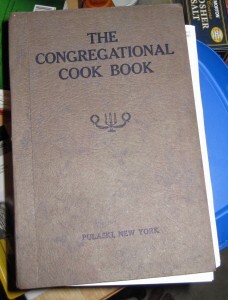 We were tickled when my great aunt presented us with a little church cookbook published in 1926 due in large part to none other than my great grandmother. With it came a recommendation of the Boston Tomato. My aunt let me know that it has always been a family favorite, especially served with roast beef. Curious, I took a look at the recipe. Now, for any of you who know me, you know I am a meticulous recipe follower. Creativity in the kitchen is not my strong suit. 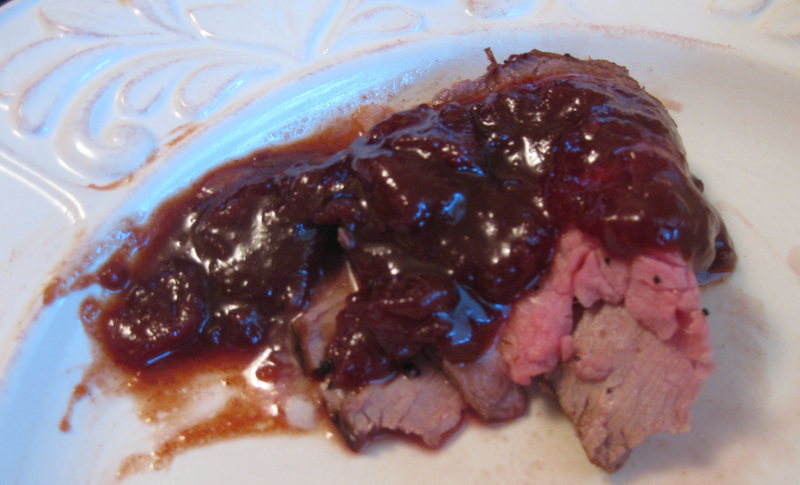 An ironclad recipe like Cook’s Illustrated often offers? Oh yeah, I can pretty much follow one of them. This recipe was not so much for the details. How far I have fallen from my great grandmother’s days when the ladies often just knew how things were supposed to turn out! Also? I don’t really like beef. Nevertheless, I figured a recipe that has been served in my family since 1926 can’t be that bad. My great aunt and her daughter vouched for it. My dad informed me that his mom used to make it, and he loved it. Apparently it even used to be canned. If I wasn’t sold before, my recent obsession with all things canning would have pushed me over the edge. I diligently waited for tomatoes to come into season. Since, well, they taste better then and it called for 8 pounds of tomatoes. Finally, mid August it was time. I managed to wrangle a friend who had a summer birthday and suggested she come over for dinner. After all, roast beef is a bit of a celebratory meal, and given that I don’t usually like it I couldn’t justify a huge hunk of meat for Chris to eat all on his own. I had gotten a hint from my dad’s cousin (great aunt’s daughter, friend’s aunt – see, we’re all related here!) that the boston tomato needed to cook all day. So, early that morning we set out to work. We opted to halve the recipe, or rather I should say Chris did. He reasoned that we had no idea how much it would make, we were only making a small roast, and frankly? 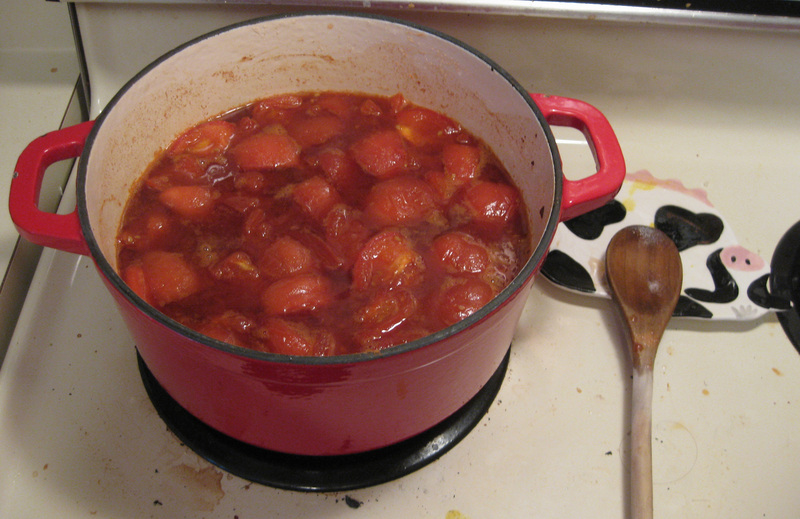 8 pounds of tomatoes is a lot of tomatoes. 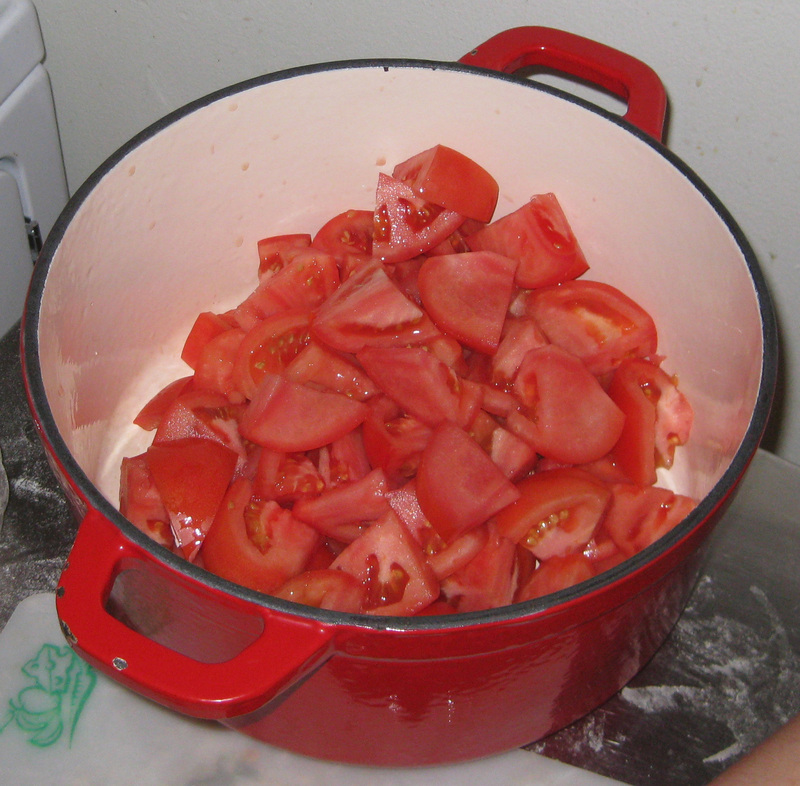 I’m glad he talked me into it, because well, as you can see, 4 pounds of tomatoes is still a lot of tomatoes. I guessed at how big to leave the tomato slices (Dad later confirmed that there were chunks in it when it’s finished). We added the sugar, turned it on and set off for a run. 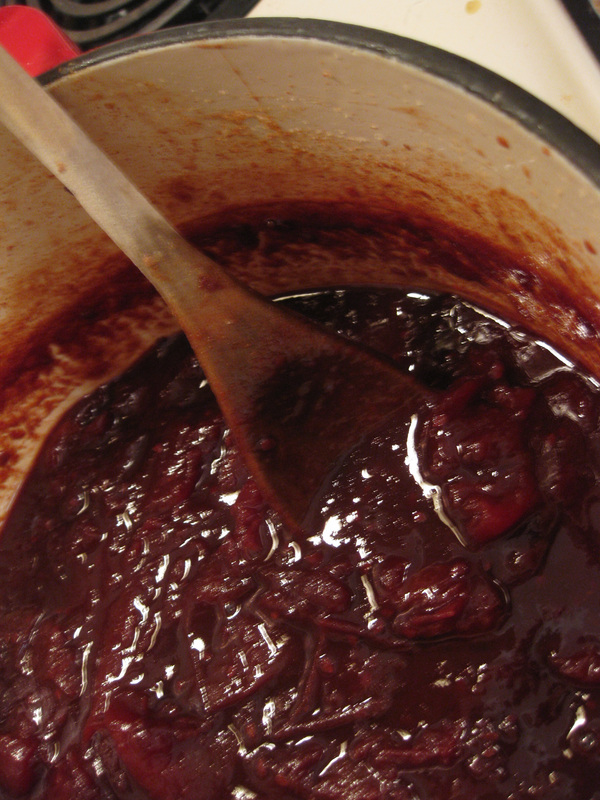 An hour later we added the cinnamon , and much to Chris’s chagrin, a fair amount of vinegar. We resisted the urge to taste it, because, well, I don’t usually like cinnamon (1 oz is a lot!) and Chris hates vinegar. Then, in a leap of faith (pun unintentional but we’ll keep it), off to church we went, unsure of how it would do while we were gone. We came back to a bubbling brew, and after stirring let it cook quite a bit longer. You could see it gradually cooking down. I finally broke down and called my dad for another hint to see how thick it should ultimately be. He couldn’t quite remember, except to say that he thought it should be pretty thick. So we called it good and tended to our roast. So how did it taste? We couldn’t quite place it, but it was pretty darn good. Didn’t taste like tomatoes. But, thankfully for us, it didn’t taste like cinnamon or vinegar either. It was just plain good. With the sliced roast beef? Even better. We were unable to describe it to our friend, except to say that it was interesting. A good interesting. She agreed and, after a few tastes, finally said it reminded her of an apple butter. That’s when it all clicked. Contains a quart of vinegar? Used to be canned? Cooks all day until it thickens on its own? Tons of cinnamon and sugar, yet makes a savory combination? Of course! It was a tomato butter! A few internet searches later and that was confirmed by a handful (apparently tomato butter isn’t too popular?) of similar recipes . Mystery solved. Of course, I was sold regardless of ever knowing the recipe’s common name. A tried and true family recipe from as far back as my great grandma that tastes as good as everyone remembers? Well, yeah, it’s a keeper. Next year? We’ll make the whole batch and, provided the ph levels check out, we’ll even can it! Update: Turns out this makes a really great pizza sauce, too. A little bacon, onions softened in the bacon grease (you only live once! ), some shredded mozzarella, goat cheese and arugula? YUM. Yum, can’t wait to try Boston Tomato. I just googled Boston Tomato, and then I found your blog! I will now be a faithful follower. 3 Pings/Trackbacks for "Boston Tomato"